Djibouti, officially the Republic of Djibouti, is a small country on the northeast coast of the Horn of Africa. Through close contacts with the Arabian Peninsula for more than a thousand years, the Somali and Afar tribes in this region became among the first on the African continent to accept Islam. Though closely related culturally and linguistically, the Afar and the Somali-speaking groups (especially the Issa) have been rivals for power and access to resources. This tension exploded into open armed conflict in the 1990s. After a military campaign to quell the Afar revolt, the government opted for a policy of compromise without endangering Issa dominance, averting full-scale "ethnicization" of politics. Djibouti's main advantage is its strategic location near the world's busiest shipping lanes, controlling access to the Red Sea and Indian Ocean with proximity to Arabian oilfields. That location is enabling it to emerge from a largely stagnant agro-pastoral rural society into a developing urban society with a bustling port. Nevertheless, poverty, unemployment, illiteracy, and poor health care challenge the government's resources. Djibouti's arid, rocky soil limits agriculture, and much of the nation's funds come from charging trans-shipment fees for goods exported from or destined for neighboring landlocked nations such as Ethiopia. Two-thirds of the inhabitants live in the capital city. The nation is leading the way in the region towards women's rights and the protection of women and children through its enactment of a "Family Law" in 2002. 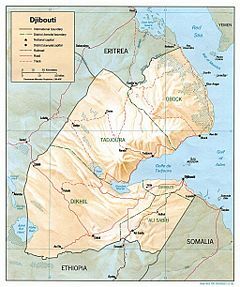 Djibouti is bordered by Eritrea in the north, Ethiopia in the west and south, and Somalia in the southeast. The remainder of the border is formed by the Red Sea and the Gulf of Aden. The Bay of Tadjoura cuts into the country from the Gulf of Aden. On the other side of the Red Sea, on the Arabian Peninsula, 12 miles (20 km) from the coast of Djibouti, is Yemen. Apart from Djibouti City, the capital and large urban center, there are a few small towns: Tadjoura, Obock, Dikhil, Ali Sabieh, and Yoboki. The country, the size of the U.S. state of Massachusetts, is mainly a stony desert, with scattered plateaus and highlands. There are inadequate supplies of potable water, and desertification is a problem. The lowest point is Lac Assal (−155 m) and the highest is Moussa Ali (2,028 m). Natural resources include geothermal power. There is no arable land, irrigation, or permanent crops, nor any forests. Its climate is mostly hot and dry. Natural hazards include earthquakes and droughts; occasional cyclonic disturbances from the Indian Ocean bring heavy rains and flash floods. There are seasonal streams that flow toward the sea or into the two salt lakes. There is one active volcano. The history of Djibouti, recorded in poetry and songs of its nomadic peoples, goes back thousands of years to a time when its population traded hides and skins for the perfumes and spices of ancient Egypt, India, and China. Through close contacts with the Arabian peninsula for more than a thousand years, the Somali and Afar tribes in this region became among the first on the African continent to adopt Islam. 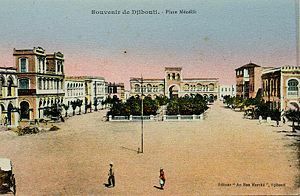 Place Menelik, Djibouti, c 1905. Rochet d'Hericourt's exploration into Shoa (1839-1842) marked the beginning of French interest in the African shores of the Red Sea. Further explorations led to a treaty of friendship and assistance between France and the sultans of Raheita, Tadjoura, and Gobaad, from whom the French purchased the anchorage of Obock in 1862. This growing French interest in the area took place against a backdrop of British activity in Egypt and the opening of the Suez Canal in 1869. In 1884-1885, France expanded its protectorate to include the shores of the Gulf of Tadjoura and the Somaliland. Boundaries of the protectorate, marked out in 1897 by France and Emperor Menelik II of Ethiopia, were reaffirmed by agreements with Emperor Haile Selassie I of Ethiopia in 1945 and 1954. The city of Djibouti, which had a harbor with good access that attracted trade caravans crossing East Africa as well as Somali settlers from the south, became the new administrative capital in 1896. The Franco-Ethiopian railway, linking Djibouti to the heart of Ethiopia, began in 1897 and reached Addis Ababa in June 1917, increasing the volume of trade passing through the port. During the Italian invasion and occupation of Ethiopia in the 1930s and World War II, constant border skirmishes occurred between French forces in French Somaliland and Italian forces in Italian East Africa. The area was ruled by the Vichy (French) government from the fall of France until December 1942. French Somaliland fell following a British blockade. Free French and Allied forces captured the French colony. A local battalion from French Somaliland participated in the liberation of France in 1944. In 1957, the colony was reorganized to give the people considerable self-government. A decree established a territorial assembly with an executive council that advised the French-appointed governor general. In a September 1958 constitutional referendum, French Somaliland opted to join the French community as an overseas territory. This entitled the region to representation in the French Parliament. French President Charles de Gaulle's 1966 visit to Djibouti was marked by public demonstrations by Somalis demanding independence. When a referendum was held in 1967 to determine whether the people would remain within the French Republic or become independent, 60 percent chose to continue the territory's association with France. In July of that year, Paris formally changed the name of the region to the French Territory of the Afars and Issas. The directive also reorganized the governmental structure of the territory, making the senior French representative, formerly the governor general, a high commissioner. In addition, the executive council was redesignated as the council of government, with nine members. In 1975, the French government began to accommodate increasingly insistent demands for independence. In June 1976, the territory's citizenship law, which favored the Afar minority, was revised to reflect more closely the weight of the Issa Somali. The electorate voted for independence in a May 1977 referendum, and the Republic of Djibouti was established in June that same year. Hassan Gouled Aptidon became the country's first president. In 1981, Aptidon turned the country into a one-party state by declaring that his party, the People's Rally for Progress (RPP), was the sole legal one. A civil war broke out in 1991, between the government and a predominantly Afar rebel group, the Front for the Restoration of Unity and Democracy (FRUD). The FRUD signed a peace accord with the government in December 1994, ending the conflict. Two FRUD members were made cabinet members, and in the presidential elections of 1999 the FRUD campaigned in support of the RPP. Aptidon resigned as president in 1999, at the age of 83, after being elected to a fifth term in 1997. His successor was his nephew, Ismail Omar Guelleh. On May 12, 2001, Guelleh presided over the signing of what is termed the final peace accord officially ending the decade-long civil war between the government and the armed faction of the FRUD. 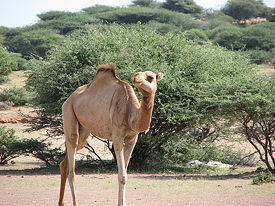 Camel in Djibouti, December 2006. In the presidential election held April 8, 2005, Ismail Omar Guelleh was re-elected to a second six-year term at the head of a multi-party coalition that included the FRUD and other major parties. A loose coalition of opposition parties again boycotted the election. Currently, political power is shared by a Somali president and an Afar prime minister, with an Afar career diplomat as foreign minister and other cabinet posts roughly divided. However, Issas predominate in the government, civil service, and the ruling party. That, together with a shortage of non-government employment, has bred resentment and continued political competition between the Somali Issas and the Afars. In March 2006, Djibouti held its first regional elections and began implementing a decentralization plan. The broad pro-government coalition, including the FRUD candidates, again ran unopposed when the government refused to meet opposition preconditions for participation. A nationwide voter registration campaign was conducted in advance of the scheduled 2008 parliamentary elections. Djibouti is a semi-presidential republic, with executive power in the government and legislative power in both the government and parliament. The parliamentary party system is dominated by the People's Rally for Progress, and the current president is Ismail Omar Guelleh. The country's current constitution was approved in September 1992. Opposition parties are allowed but have no real chance of gaining power. The government is seen as being controlled by Somali Issas, though power is shared between a Somali president and an Afar prime minister, with cabinet posts similarly divided. The country recently emerged from a decade-long civil war, with the government and the Front for the Restoration of Unity and Democracy (FRUD) signing a peace treaty in 2001. Two FRUD members are part of the current cabinet. Despite elections of the 1990s being described as "generally fair," Guelleh was sworn in for his second and final six-year term as president in a one-man race on April 8, 2005. He took 100 percent of the votes with a 78.9 percent turnout. Opposition parties boycotted the election, describing the poll as "ridiculous, rigged, and rubbish." Djibouti's second president, Guelleh was first elected to office in 1999, taking over from Hassan Gouled Aptidon, who had ruled the country since its independence from France in 1977. The prime minister, who leads the council of ministers (cabinet), is appointed by the president. The parliament consists of sixty-five members who are elected every five to seven years. Djibouti's military and economic agreements with France provide continued security and economic assistance. Links with Arab states and East Asian states, Japan and the People's Republic of China in particular, also are welcome. Djibouti is a member of the Arab League, as well as the African Union (AU), and the Intergovernmental Authority on Development (IGAD). After the terror attacks of September 11, 2001, Djibouti joined the global War on Terror, and now hosts a large military camp, home to soldiers from many countries, but primarily the United States. Djibouti has forged strong ties to the United States in recent years, and foreign aid from Washington plays the lead role in Djibouti's economy. Djibouti is greatly affected by events in Somalia and Ethiopia, and therefore relations are important and, at times, very delicate. The fall of the Siad Barre and Mengistu governments in Somalia and Ethiopia, respectively, in 1991, caused Djibouti to face national security threats due to the instability in the neighboring states and a massive influx of refugees estimated at a hundred thousand from Somalia and Ethiopia. In 2000, after three years of insufficient rain, fifty thousand drought victims entered Djibouti. In 1996 a revitalized organization of seven East African states, the Intergovernmental Authority on Development (IGAD), established its secretariat in Djibouti. IGAD’s mandate is for regional cooperation and economic integration. In 1991 and 2000, Djibouti played a key role in the search for peace in Somalia by hosting Somali reconciliation conferences. In the summer of 2000, Djibouti hosted the Arta Conference, which brought together various Somali clans and warlords. Djibouti's efforts to promote reconciliation in Somalia led to the establishment of the Transitional National Government (TNG) in Somalia. Djibouti hopes the TNG can form the basis for bringing peace and stability to Somalia. With the Eritrean-Ethiopian War (1998-2000), Ethiopia channeled most of its trade through Djibouti. While Djibouti’s president has close ties with Ethiopia’s ruling Ethiopian People's Revolutionary Democratic Front (EPRDF), he has tried to maintain an even hand, developing relations with Eritrea. Though Djibouti is nominally neutral, it broke off relations with Eritrea in November 1998, renewing relations in 2000. Eritrea's President Isaias visited Djibouti in early 2001, and President Ismail Omar Guelleh made a reciprocal visit to Asmara in the early summer of 2001. Djibouti has been the host country for French military units since independence. 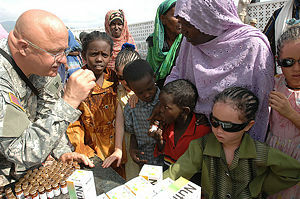 In 2002, U.S. units began operations from Djibouti with the aim of countering the possible threat of Islamic terrorism in the Horn of Africa. Somalia has in the past claimed the areas of Djibouti inhabited by Somalis as part of the Greater Somalia idea. Map of the regions of Djibouti. 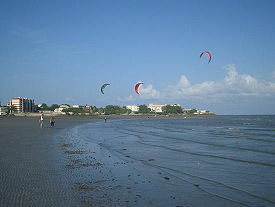 Djibouti is divided into five regions and one city. It is further subdivided into eleven districts. Djibouti is mostly barren, with little development in agriculture and industry because of the harsh climate, unskilled labor, and limited natural resources. The country’s most important economic asset is its strategic location connecting the Red Sea and the Gulf of Aden. As such, Djibouti’s economy is dominated by the services sector, providing services as both a transit port for the region and an international transshipment and refueling center. 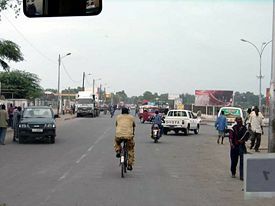 Typical street in the city of Djibouti. 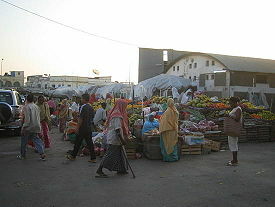 Flea Market in Djibouti City. Two-thirds of the inhabitants live in the capital city, the remainder being mostly nomadic herders. Scant rainfall limits crop production to fruits and vegetables, and most food must be imported. There is little or no mineral wealth, and there is no known oil off the coast. The people, while more educated than many of their regional counterparts, are not well–trained enough to offer international business skills. Infrastructure does not provide the requirements for attracting significant international business. Djibouti's main advantages have been its strategic position. It has a vibrant port in a region of large landlocked countries. The nation is, however, heavily dependent on foreign assistance to help support its balance of payments and to finance development projects. Faced with a multitude of economic difficulties, the government has fallen into arrears on long-term external debt and has been struggling to meet the stipulations of foreign aid donors. An unemployment rate of over 50 percent continues to be a major problem. Inflation is not a concern, however, because of the fixed tie of the franc to the U.S. dollar. Per capita consumption dropped an estimated 35 percent over the last several years because of recession, civil war, and a high population growth rate (including immigrants and refugees). Half the population lives below the poverty line (2004 est.). Banking and insurance total 12.5 percent of GDP, public administration 22 percent of GDP. Other important sectors are construction and public works, manufacturing, commerce, and agriculture (less than 3 percent of GDP). GDP per capita is $450. Renewed fighting between Ethiopia and Eritrea was beneficial to Djibouti, with the Port of Djibouti now serving as landlocked Ethiopia's primary link to the sea. From 1991 to 1994, Djibouti experienced a civil war that had devastating consequences for the economy. Since then, the country has benefited from political stability. In recent years, Djibouti has seen significant improvement in macroeconomic stability, with its annual GDP growth averaging over 3 percent since 2003 after a decade of negative or low growth. This is attributed to fiscal adjustment measures aimed at improving public financing, as well as reforms for improving port management. Despite recent modest and stable growth, Djibouti is faced with compelling challenges, particularly job creation and poverty reduction. With an average annual population growth rate of 2.5 percent, current economic growth cannot increase significantly real income per capita. Unemployment is extremely high at over 50 percent, and is a major contributor to widespread poverty. Efforts are needed in creating conditions that will enhance private sector development and accumulate human capital. These conditions can be achieved through improvements in macroeconomic and fiscal framework, public administration, and labor market flexibility. Djibouti's stable economic growth in recent years is a result of achievements in macroeconomic adjustment efforts. Fiscal adjustment measures included downsizing the civil service, implementing a pension reform that placed the system on a much stronger financial footing, and strengthening public expenditure institutions. From 2003 to 2005, annual real GDP growth averaged 3.1 percent, driven by good performance in the services sector and strong consumption. The fiscal balance has been in deficit because the government has not been able to raise sufficient tax revenues to cover the expenses. In 2004, a substantial increase in expenditure resulted in a deterioration of the fiscal position. As a result, the fiscal deficit increased to US$17 million in 2004 from US$7 million in 2003. But improvement in expenditure management brought down the fiscal deficit to US$11 million in 2005. With its accessibility to the Red Sea, Djibouti holds major strategic importance. The facilities of the port of Djibouti are important to ocean fleet services for fuel bunkering and refueling. Its transport facilities are used by several landlocked African countries for re-export of their goods, from which Djibouti earns transit taxes and harbor fees. This strategic location also has ensured a steady inflow of foreign assistance. The port of Djibouti functions as a small French naval facility, and the United States also has stationed hundreds of troops in Djibouti, its only African base, in an effort to counter terrorism in the region. The government of Djibouti welcomes all foreign direct investment. Djibouti's assets include a strategic geographic location, an open trade regime, a stable currency, substantial tax breaks, and other incentives. Potential areas of investment include Djibouti's port and telecom sectors. President Ismail Omar Guelleh has placed privatization, economic reform, and increased foreign investment as top priorities for his government. He has pledged to seek the help of the international private sector to develop the country's infrastructure. While Djibouti has no major laws that would discourage incoming foreign investment, certain sectors, most notably public utilities, are state owned and some parts are not currently open to investors. Conditions of the structural adjustment agreement signed by Djibouti and the IMF stipulate increased privatization of parastatals and government-owned monopolies. As in most African nations, access to licenses and approvals is complicated not so much by law as by administrative procedures. In Djibouti, for example, the Finance Ministry will issue a license only if an investor possesses an approved investor visa, while the Interior Ministry will only issue an investor visa to a licensed business. The government is more and more realizing the importance of establishing a one-stop shop to facilitate the investment process. Principal exports from the region that transit Djibouti are coffee, salt, hides, dried beans, cereals, other agricultural products, and wax. Djibouti itself has few exports, and the majority of its imports come from France. Most imports are consumed in Djibouti, and the remainder goes to Ethiopia and northwestern Somalia. Its major export markets (2004) are France, Ethiopia, Somalia, India, China, Saudi Arabia, and other Arabian peninsula countries. Djibouti's unfavorable balance of trade is offset partially by invisible earnings such as transit taxes and harbor dues. 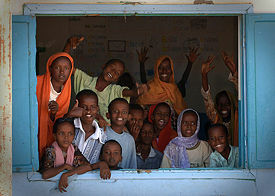 Djiboutian students smile and wave after Combined Joint Task Force-Horn of Africa (CJTF-HOA) personnel handed out soccer balls during a visit to their school in Balbala, Djibouti, Nov. 20, 2006. (U.S. Navy photo). The population is divided into two main groups: the Issa of Somali people and the Afar. The remainder are Europeans (mostly French and Italians), Arabs, and Ethiopians. Tensions between the Afar and Issa were the cause of the civil war in the early 1990s. 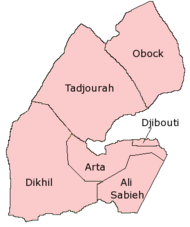 The Somali ethnic component in Djibouti is mainly composed of the Issas, who form the majority (60 percent). Although French and Arabic are the official languages, Somali and Afar are widely spoken. Both are Cushitic languages. The ethnic divide between the Issa and the Afar dominates the social and political landscapes. It is the cause of political hostilities and the root of what some at one time called Djibouti's "boiling cauldron." In the late 1980s and early 1990s there was a renewed effort to create a "greater Afar" nation that led many to believe that the cauldron would boil over. Ultimately, the conflict abated without significant regime upheaval. In the political sphere there have been attempts at power sharing to try to quell the conflict, though the political dominance of the Issa continues to be a source of Afar resentment and periodic unrest. In the social sphere the divide looms large. The bulk of Djibouti's people are urban residents; the remainder are herders. Health, sanitary, and education services are relatively poor in both urban and rural areas. The average life expectancy in Djibouti is 43 years of age. The HIV/AIDs infection rate is lower than in many other African countries at only 2.9 percent. About 46 percent of the population is literate, although it is higher for males than for females. The UN Human Development Index places Djibouti in the low human development category, at 150th place. Among the 15,000 foreigners residing in Djibouti, the French are the most numerous and include 3,200 troops. There is also a sizable Arab population, which constitutes about 5 percent of the population. There is a divide in Djibouti between those who are of Arab descent and those who are of African descent. The Arab population plays a disproportionately powerful role in the commercial sector. The divide is further complicated by the fact that though Djiboutians share a faith in Islam, the Arab population holds the dominant commercial connection to the broader Arab world. Arab influence in the political sphere has been limited predominantly to its role in civil society. Djibouti is a source, transit, and destination country for women and children trafficked for the purposes of sexual exploitation and possibly forced labor; small numbers are trafficked from Ethiopia and Somalia for sexual exploitation; economic migrants from these countries also fall victim to trafficking upon reaching Djibouti City or the Ethiopia-Djibouti trucking corridor; women and children from neighboring countries reportedly transit Djibouti to Arab countries and Somalia for ultimate use in forced labor or sexual exploitation. Djibouti does not fully comply with the minimum standards for the elimination of trafficking; however, it is making significant efforts to do so based partly on the government's commitments to undertake future action. In 2002, following a broad national debate, Djibouti enacted a new "Family Law" enhancing the protection of women and children, unifying legal treatment of all women, and replacing Sharia. The government established a minister-designate for women's affairs and is engaged in an ongoing effort to increase public recognition of women's rights and to ensure enforcement. In 2007, it began establishing a network of new counseling offices to assist women seeking to understand and protect their rights. Women in Djibouti enjoy a higher public status than in many other Islamic countries. The government is leading efforts to stop illegal and abusive traditional practices, including female genital mutilation. As the result of a three-year effort, the percentage of girls attending primary school increased significantly and is now more than 50 percent. However, women's rights and family planning continue to face difficult challenges, many stemming from acute poverty in both rural and urban areas. With female ministers and members of parliament, the presence of women in government has increased. Despite the gains, education of girls still lags behind boys, and employment opportunities are better for male applicants. Djibouti's main religion is Islam (94 percent). Every town and village has a mosque, to which people go to worship. Tombs of their former religious leaders and those considered "holy" are known as sacred spaces. The most famous sacred space for Islam in Djibouti is the tomb of Sheikh Abu Yazid, found in the Goda Mountains. In addition to the Islamic calendar, Muslims in Djibouti also recognize New Year's Eve (January 1), and Labor Day (May 1), as holidays. Christianity is the main other prevalent religion. There is minimal religious tolerance. Being of another religion is greatly discouraged, especially because Djibouti's state religion is declared Islam. Djiboutian attire reflects the hot, arid climate. Men wear a loosely wrapped piece of cloth that goes down to about the knee, along with a cotton robe over the shoulder, much like a Roman toga. Women wear long skirts, typically dyed brown. Married women wear cloth to cover their heads, sometimes also covering their upper body. Unmarried or young women do not cover their heads. Traditional Arabian dress is worn strictly during religious festivals, especially in preparation for the hajj. For some occasions, women may adorn themselves with jewelry and headdresses. A lot of Djibouti's original art is passed on and preserved orally, mainly through song. Using their native language, the people sing or dance a story, acting it out. Many examples of French and Islamic influences can be noted in their buildings, which contain plasterwork, carefully constructed motifs, and calligraphy. Dairy products and meat from the herds are the traditional foods, along with grain dishes. In urban areas, the diet is influenced by Italian and other European foods. The narcotic leaf qat, which is imported from Ethiopia, is consumed recreationally by virtually all men, preferably after lunch, when government offices and work come to a standstill in the midday heat. Djibouti is made up of two main ethnic groups: the Afar and the Somalis, along with French and Arab citizens. Afar music is similar to the music of Ethiopia with elements of Arab music. The Somali oral traditions include an array of poetry and proverbs, much of it devoted to the lives of Sufi saints. Afar oral literature is more musical, and comes in many varieties, including songs for weddings, war, praise and boasting. "Miniature poetry," invented by a truck driver named Abdi Deeqsi, is well known in Djibouti; these are short poems (balwo), mostly concerning love and passion. Balwo is also a style of Somali popular music. Djiboutian instruments include the tanbura, a bowl lyre. ↑ Djibouti. World Factbook. Central Intelligence Agency. Retrieved December 27, 2011. ↑ 2.0 2.1 2.2 2.3 Djibouti. International Monetary Fund. Retrieved December 27, 2011. Countries and their Cultures. Culture of Djibouti. Retrieved September 9, 2007. British Broadcasting Corporation. Country profile: Djibouti. This page was last modified on 17 October 2017, at 21:59.